This Hawk 17 inch floor buffer with dust containment kit is a beast! 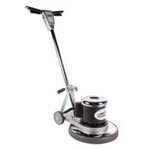 It features a 1.5 HP induction run, continuous-duty, vibration-free motor. The sealed motor utilizes dual capacitors on start up on high friction surfaces like those found in the sanding & wood refinishing industry. It can also be used for scrubbing and stripping purposes. It truly is a beat that can do it all! This unit can be configured in the above menu to buy the machine by itself, or with the dust containment kit and additional weights. The dust containment kit has a 1.5" vacuum port for immediate recovery of dust and debris created during sanding and buffing. The fan cooled motor is totally enclosed, which keeps out dust and dirt for longer motor life. Simply attach a backpack vacuum or wet/dry vac to increase productivity by instantly recovering that dust created during those processes. A pad holder needs to be purchased separately if you do plan to use it for any type of buffing, scrubbing or stripping. We also have a full line of brushes available for different purposes. Not only is this machine perfectly suited for scrubbing hard surfaces, but it can also be used to sand them down with any of the different floor sanding screens.